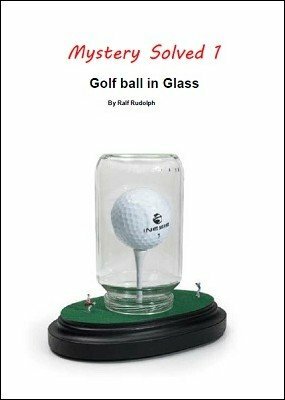 You will learn the secret of how to get a golf ball inside a glass with an opening smaller than the golf ball, without harming either the glass or the ball. Ralf Rudolph is a master of the impossible object. He describes his method of how to make such an object. Once you know how it is done you can make as many presents as you wish. No special tools are necessary. No chemicals are used. With a bit of preparation and the know how you can make something cool. Watch how Nathan Coe Marsh incorporates this impossible bottle into a really nice effect. Genius at work! I will be attentive towards everything me.Rudolph releases. The videos are home-made quality, there are no flashy credits with special effects and fancy music on the background. You are purchasing a solid content, and all bs that you see in *all* magic product presentations these days aimed at making things more attractive to the buyer - all of them are narrowed to zero. The good news is that the mr. rudolph's releases stand on their own. At least, this is my experience with his downloads. No monkey circus, only straight-to-the-point creative thinking. I'm a big fan. Devin Knight has covered all that is important use items that spectators would not expect or have seen used in a magic effect routine with amazed responce. Following the instructions I have successfully put a golf ball into a jar myself. The golf ball in glass was used on the Penn & Teller Fool Us TV show. The magician used a force to have an item chosen from a list. It was a golf ball. He showed a duplicate empty jar which was secretly switched. A golf ball appeared inside the jar; he showed it could not be removed, proving it must have materialized inside. (Otherwise, how else did it get inside the jar?) This was a clever use of this idea, showing how this impossible object can be applied to magic routines and not just as a novelty to look at. A clever idea worth knowing.